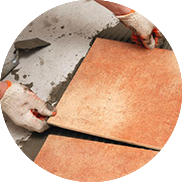 Widely used for flooring and wall tile applications. Due to its exceptional strength, it is well suited for exterior applications such as cladding, paving and curbing. 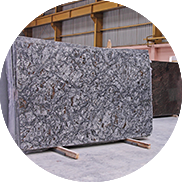 Granite tiles are available in different colors and patterns. Porcelain is much harder than ordinary ceramic tiles. It can be used in dry areas such as wall murals, dadoes and less traffic zones. The density and composition of porcelain tile allows it to be used in a variety of applications indoor and outside in the most extreme weather conditions. 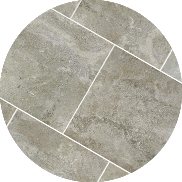 Porcelain tiles are available in different patterns and categories. Marble is commonly used for internal and external wall cladding purposes, landscaping applications such as patio, swimming pool and walkway tiles or pavers. Marble tile is also used to decorate residential fireplaces and bathrooms. Commercial applications of marble are, hotel foyer decoration, table tops, counter tops, bathrooms and kitchens. 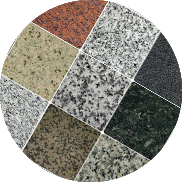 Granite remains the top choice for kitchen counter tops and widely used for flooring and wall tile applications. 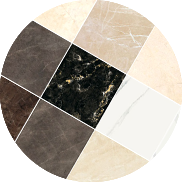 Tiles and accessories available, ranging from mixtures, fitting materials and more on request.